Resources that support the MyPlate On Campus initiative, such as this toolkit, are available for free download at ChooseMyPlate.gov. In March 2013, the USDA Center for Nutrition Policy and Promotion launched the MyPlate On Campus initiative to help spread healthy eating messages to young adults during their college years. What makes MyPlate On Campus unique is that it not only empowers students to improve their own eating and physical activity habits, but also encourages them to bring their peers along for the ride. The college environment can be hard to navigate and students may need a little help. Students are learning to manage a busy class schedule, make food decisions in all-you-can-eat settings, and live on their own for the first time. MyPlate On Campus shows young people how to build healthy habits with practical tips and tools. Here are a few simple steps to stay healthy on campus. In a dorm room, stock the mini-fridge. Have a variety of pre-cut and pre-washed veggies on hand. Try carrots, peppers or sugar snap peas. Hummus, salsa and nut butters used as dips make veggies even tastier. In the dining hall, re-think your drink! Americans drink about 400 calories everyday from sodas, cappuccinos, energy drinks, sports drinks, etc. Drink water to manage your calorie intake. Vow to take the stairs to class instead of the elevator. Choose a fitness class as an elective. For more healthy campus-living ideas, refer to the Mini-Fridge Makeover, Be Choosey in the Dining Hall and Stay Fit on Campus resources, from the 10 Tips Nutrition Education Sheets. These tip sheets can be placed on a refrigerator or bulletin board for a healthy reminder. Students interested in promoting health and wellness to others in their campus communities are invited to sign up as a MyPlate On Campus Ambassador. This partnership program is designed to motivate students to take on a leadership role at their school by teaching others about nutrition and physical activity. Ambassadors complete an online training and have access to a MyPlate On Campus Toolkit which helps them get started. The Toolkit contains resources specific to college students and offers tips for Ambassadors as well as the faculty/staff supporting them. There are currently more than 1,700 Ambassadors taking action on campuses in all 50 states. Cooking demos, grocery store tours, and health fairs are just a few activities Ambassadors are using to spread MyPlate across their campuses. In addition, Ambassadors are using SuperTracker, a free online tool that provides users with a personalized nutrition and physical activity plan. SuperTracker allows Ambassadors and their peers to track their food choices, set activity goals, and monitor progress. 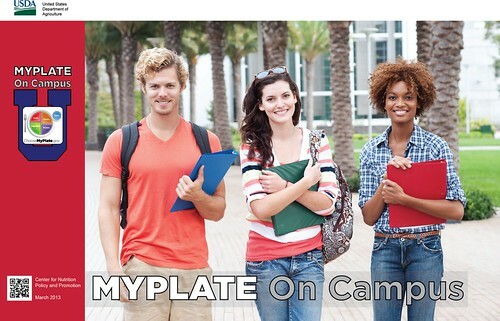 Follow MyPlate on Twitter @MyPlate and on Facebook to learn more about the MyPlate On Campus initiative. For more information visit ChooseMyPlate.gov. The challenge is to find a grocery store that students can walk to from campus to stock their refrigerators with fresh veggies. Most easily available foods are packaged. With the advent of trayless dining halls, students are less able to spirit away fresh food.